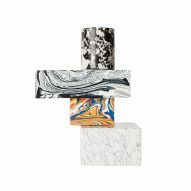 Tom Dixon has designed a collection of candle holders and bookends, made from a newly developed material that resembles three-dimensional marbled paper. 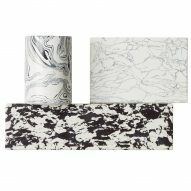 Comprised of a series of geometric candle holders, bookends and vases, each item in the Swirl collection is made from a "mysterious" material that resembles 3D marbled paper, but has the weight of stone. The collection was launched at Maison&Objet furniture and interiors fair in Paris, which runs from 18 to 22 January 2019. 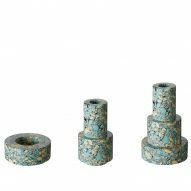 Dixon hasn't revealed the precise details of how it manufactures this new material, but said it is made from recycled powdered residue taken from the marble industry. This powder is mixed with pigment, to give the bold colours, and resin to create blocks of material. These can be sawn, sliced and turned on a lathe to create different objects. Described by the studio as "substantial in weight, smooth in texture and bold in pattern", each item bears its own unique colour formations and markings due to the nature of pigmentation and the pouring process. 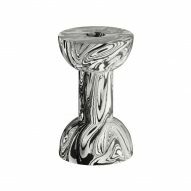 The collection includes three different types of candleholders – stepped, cone and dumbbell – and two candelabra boasting distinct tones and compositions. 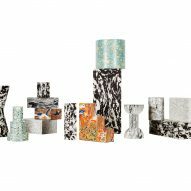 Each candelabrum is made up of several stacked, geometric volumes coloured in either black and white or a mixture of vivid orange, blue and yellow with hints of red. 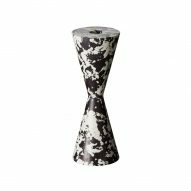 Swirl also includes a series of differently-patterned stepped bookends and a group of sculptural vases, all featuring designs that emulate natural rock formations, or the effect of marbling on paper. 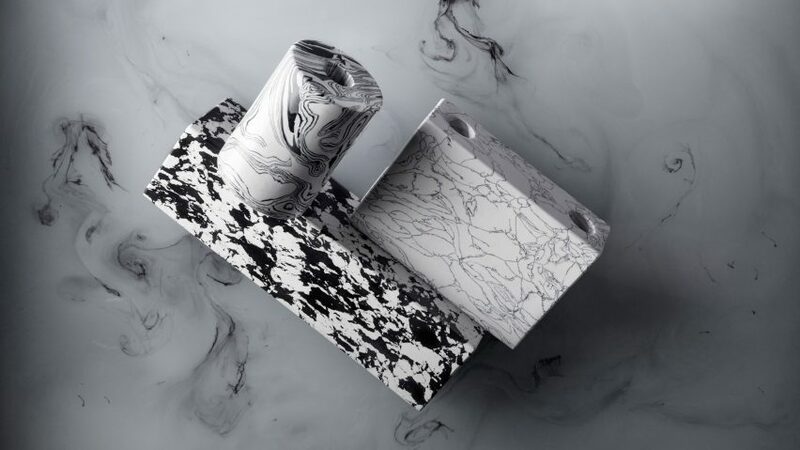 The British designer often works with real marble in his designs, and has previously described his relationship with the material as a "love affair". During Milan furniture fair, Dixon told Dezeen: "Marble, wood and plastic, glass, iron, brass and copper are the basic building blocks that have defined our products from the outset." The designer has previously released a series of candle holders and serving platters made from green forest marble sourced from India. Called Rock, the collection was inspired by Dixon's many trips to India where he observed the hand lathe workers of Rajasthan and Agra.